Well ok, it's GravSim that is on Wikipedia. My GravSim skills are merely functional, but I did upload an image showing "The motion of Orcus relative to a rotating frame of Neptune's average semi-major axis. Plotted from 2009 to 11775 with a time step of 1.5 days on a scale of 126 AU." It's a start. Any suggestions on a better way to word it? Would it be better to say: "relative to a rotating frame of Neptune's average orbital period"? Or should I get wordy and say: "relative to a rotating frame of Neptune's average orbital period and semi-major axis"? As Orcus is a Plutino with a similar orbit as Pluto itself I had the idea to represent them both in the same animation , also in rotating frame to Neptune . Animation hereunder was run for 41 frames each having 3*164.8 years ( 3 times Neptunes orbital period) . Pluto is in grey , Orcus in red . That'a really neat animation. It also illustrates the near 2:1 resonance with Uranus. Uranus is tracing an oval 2:1 pattern, but it does not librate, indicating it is simply a near resonance. If you re-time your animation so Uranus doesn't jump as the animation loops, it would be even more obvious. See my animation here http://www.orbitsimulator.com/gravity/articles/pluto.html for an example. "The motion of Orcus in a frame of reference rotating with a period equal to Neptune's orbital period." "The motion of Orcus in a rotating frame of reference where Neptune is held stationary". 1. You have 2 bodies and the general public is not use to rotating frames. 2. Neptune is not clearly labeled when quickly viewing the thumbnails contained in an article. 3. Uranus has a funny circle. 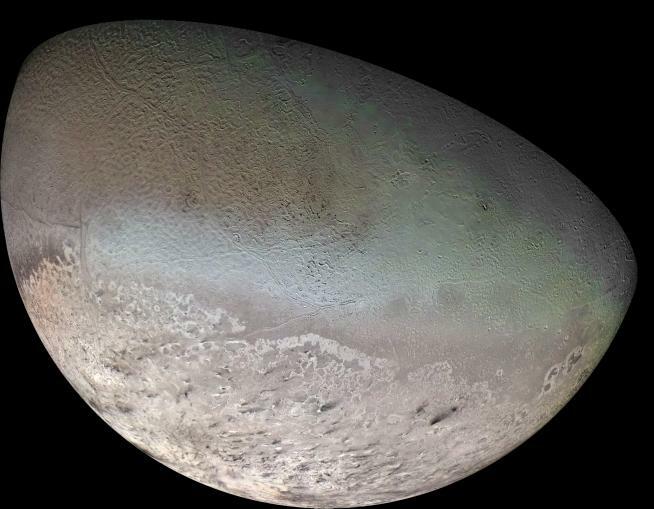 In your animation, I assume that Pluto has mass and that Orcus is massless? That is how it is in my gsim file. I added a GravSim picture of the orbit of 2007 OR10 compared to the orbits of Eris and Pluto. It's not much, but it is a start. Curious as always I've run a simulation of another plutino : 2007JH43. Simulation was run in rotating frame to Neptune with a frame period of 3 times Neptunes obital period , just as in the above simulation of Orcus . The Plutinos orbit is amazing as it seems to morph its orbit . Wow. 2007 JH43 is an interesting object. It is a good thing this object still has only a provisional designation. It has been observed 29 times over 5 oppositions with a quality code of 3. With an absolute magnitude of 4.7, this object crudely estimated (assumed albedo 0.09) should be ~500km in diameter. Place your bets? Plutoid Plutino? How does (119951) 2002 KX14 compare? Does Neptune cause a wobble in it? Thanks for the link . TNO's are really great to simulate . I'll let you know tomorrow about 2002KX14 if I've some time . 2002 KX14 may be called a Plutino in wiki , but integration shows it isn't really in resonance with Neptune as Pluto is . Hereunder the evolution of the SMA of both bodies . As mentionned yesterday I've run the 1995DA2 asteroid , known to be in 4:3 resonance with Neptune . Each frame covers 4 orbits of Neptune . Due to the 4:3 resonance the orbit of 1995DA2 shows three lobes . In the meantime we get familiar with the librating features of such orbits in rotating frame.